***** “OMG - I can't believe this app it is so good I have got all of my mums Xmas gifts and birthday gifts everyone get this app now!! who ever made this app is fantastic, creative, imaginary and I'm just so speechless he or she is just such an amazing legend p.s I'm about to have a heart attack because it is so cool bye bye” - Tangy Mango, AU ***** "Superb! Now I can actually remember what people really want :) - Just what I need to remember what that clever idea I had for a present was when I'm actually near a shop to get it.I've tried keeping such lists on bits of paper but they always get lost or I don't have them on me when I'm out. This will make a happier xmas for me and the relatives!" - Red Yetti, UK ***** "Good little app! - Exactly what I need to keep my Christmas lists organized! I have a list for each family member and then created a separate list for stockIng stuffers. I also created a list of activities we want to do as a family during the season. I like how easy it is to mark something complete (or purchased) with just a swipe." - Nruffels, US ***** "Perfect! - Easy to use. Great focused design. 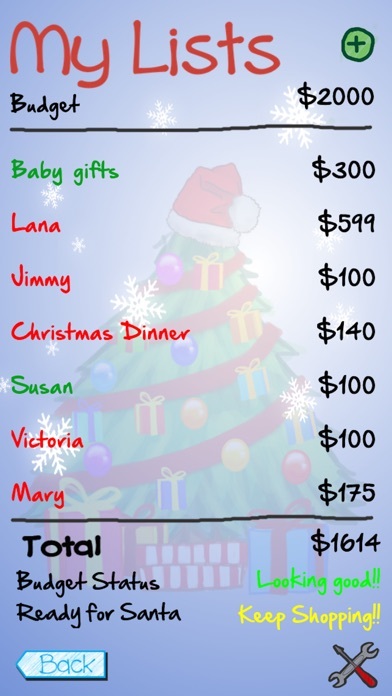 Going to start planning my Christmas shopping now." - Xnitex, AU ***** "So convenient! 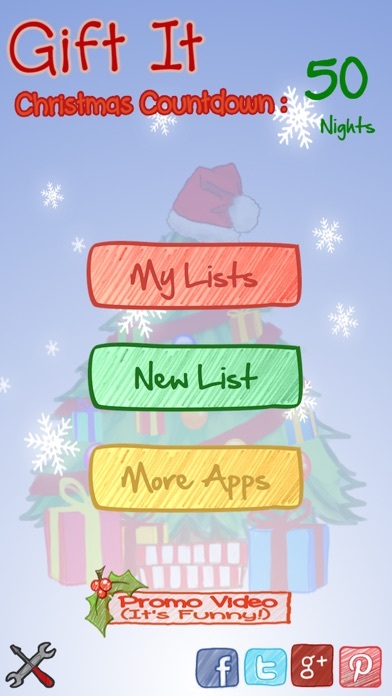 - Great way to keep all your lists straight!" - Mandimarie88, US ***** The above quotes are actual iTunes 5-star reviews from our users. 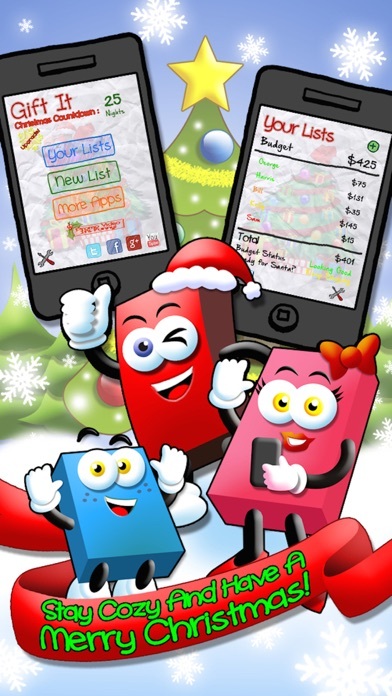 ----------------------------------------------- "Gift It" is a simple and fun Christmas shopping list app that will help you organize and keep track of all the gifts for your family, friends, and loved ones this holiday season. Don't let the stress of the holidays and waiting in long lines keep you from enjoying the lighter side of Christmas. Think of "Gift It" as the personal assistant for all of your holiday organization. Never forget that present for a special someone and never buy the wrong gift again! "Gift It" is the essential must-have tool to prepare you for Christmas Day 2017. And be sure to see the What’s new section for a whole slew of updates! 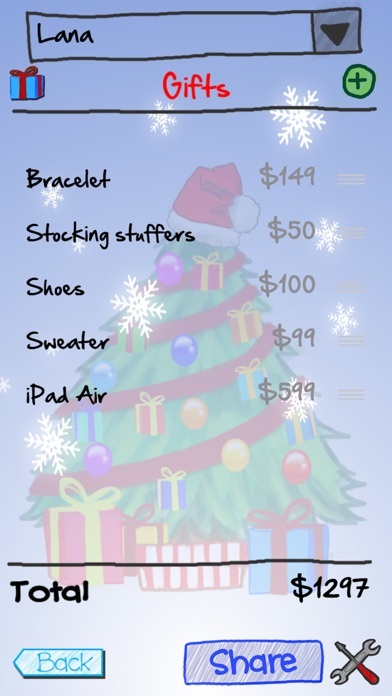 How-to's and Features of our Christmas shopping list app: - Share, Edit, Duplicate and Delete your Christmas lists by pressing on any list name on the "Your List" screen - Go to Settings and choose your method of removing a purchased gift from a Christmas list, change currencies and control your upgrades. 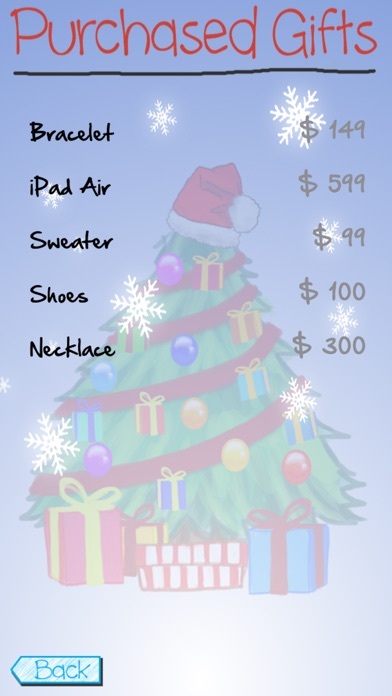 1) Swiping moves a gift to the bottom of list -Swipe across a gift from left-to-right after purchasing a gift -Swipe from right-to-left on a purchased gift to add it back to the Christmas list -Press the Gift icon to move the crossed out item to your Purchased Gifts section 2) Swiping moves a gift to the Purchased Gifts section -Swipe from left-to-right to move a gift immediately to the Purchased Gifts section -Add a purchased gift back to the Christmas list by pressing on that gift -Our Settings option allows your Christmas list progress to be shown according to: 1) Percentage of completeness 2) By a color scale. Red means you still have some shopping to do. If its green then someone will be very happy this Christmas (i.e. your shopping is complete)! **PLEASE NOTE: We cannot immediately help you if you ask for help in an app store review ** If you have any questions, need support, or have feedback, please feel free to email us at info@switchbackmediaapps.com For general updates, frequently asked questions and breaking info on the app: Follow us @GiftItApp on Twitter Check us out on our Facebook page https://www.facebook.com/giftitchristmasshopping And we'll be happy to get back to you (usually within 24 hours) Cheers and Merry Christmas! Download this app to the device you use most because it doesn’t sync between them. App crashes when I try to swipe items on list to purchased. Please update!!! This app helps be stay organized and on budget. Great tool to have at Christmas time! I am not able to delete from the lists I make. I would also like to have the to show what has been purchased. Also, I have this app on my iPad and IPhone but the iPhone app doesn’t show any entries. GREAT Ap. So easy to use. I have my list with me anytime I come across something I see I may want to pick up for s gift and can check to see who else I need to buy for. I don't know what I'd do without this app every year. It helps make my shopping so much easier! I love having my lists to keep track of my progress! One of my all time favorite apps! This app has kept me on track with our budget for about 4 years now. I depend on it every day.